Born as Louis Joseph Gregoire in 1844 at St. Hyacinthe, Province of Quebec, Lewis Gregory was the brother of my Great Grandmother, Marie Elise (Gregoire) Lessard. An undated clipping (circa June 28, 1913) of a Pawtucket (Rhode Island) Evening Times article about a planned reunion in 1913 at Gettysburg, for veterans of the battle, contained information about the members of the Tower Post of the "Grand Army of the Republic " in Pawtucket who would not be able to attend the reunion. 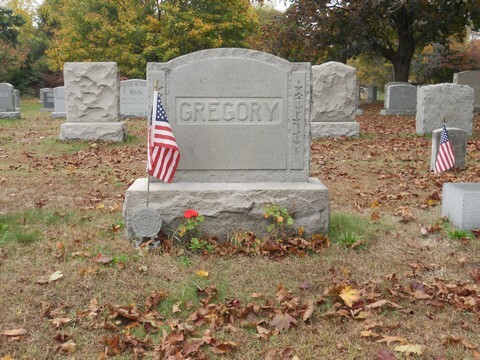 In addition to the name of my Great Grandfather, Abraham Lessard (Company E, Fifth Regiment of Vermont Volunteers and husband of Marie Elise Gregoire), one of the other men mentioned was a Louis Gregory, and his biographical sketch in the newspaper article was as follows: "Louis Gregory, who for many years worked as a bolt maker for the Pawtucket Manufacturing Company, was in the battle with the 10th Vermont Volunteers and saw active service during the entire war. He is retired and makes his home at 40 Vincent Avenue where he has taken up farming for a diversion". An inquiry was mailed to the National Archives in Washington, DC for Lewis' Civil War Veterans' pension application records. The information received is not only of importance to me for its genealogical implications, (if Lewis was born in St. Hyacinthe, maybe his sister and parents were born there too?) but is also of importance to the VermontCivilWar.Org for historical purposes. A "Declaration for Invalid Pension", dated June 30th, 1903, attests that Lewis Gregory was honorably discharged from Company C of the 10th Regiment of Vermont Volunteers at Balls Cross Roads on June 17, 1865. In the same document, he stated that as of June 30th, 1903, he was suffering from rheumatism, weak eyes, heart trouble, dyspepsia, kidney trouble, and neuralgia. He signed this document with "his mark" ("X"). It was witnessed by Abraham Lessard and Frank C. Sanford, his brothers in law. Abraham Lessard's address was listed as 21 Hayward St., Pawtucket, and Frank C. Sanford's address was listed as 23 Carson St., Pawtucket. Abraham stated that he had known Lewis for 30 years and Frank stated that he had known Lewis for 12 years. Abraham's and Frank's signatures were not "marks". A document from the War Department, Record and Pension Office, dated August 14, 1903, states that Lewis Gregory of Company C of the 10th Vermont Infantry was enrolled on July 15, 1862 and discharged June 17, 1865, by reason of his enlistment on the following day in Battery E, First US Artillery. He held the rank of private. His place of birth is listed as "Canada", his age 18 years, occupation as farmer, 5 feet six inches tall, light complexion, grey eyes, brown hair. That Lewis Gregory was born in Montreal, Canada, age 21 years, by occupation a soldier, having grey eyes, brown hair, ruddy complexion, 5 feet six inches tall. That he enlisted on June 18, 1865 at Fort Strong, VA, in Battery E, First Regiment of the US Artillery. That he was discharged June 8, 1868 at Fort Schuyler, NY, by expiration of service. That he was a private. That his enlistment papers indicated prior service in Company C, Tenth Vermont Volunteer Infantry. When Enlisted? First enlistment July 15, 1862. Second enlistment June 18, 1865. When Discharged? First enlistment June 17, 1865. Second enlistment June 18, 1868. Where Discharged: First discharge at Balls Cross Roads, VA. Second discharge at Fort Schuyler, New York Harbor. Any permanent marks or scars? A scar on neck below left ear about 2 ½ inches long. That his wife's maiden name was Sophie Languirand and that they were married by Bernard Plunkett on November 29, 1868. That the record of their marriage should be at the town clerk's office in Cumberland, RI. That neither he nor his wife had been married previously. 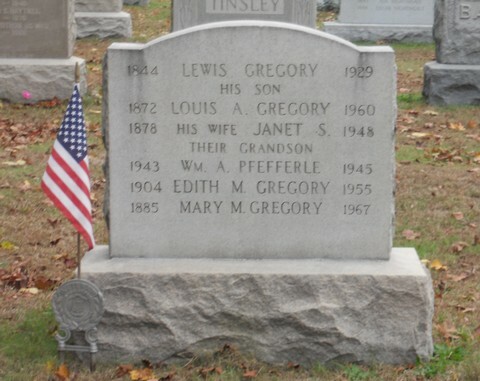 That their children were Louis Abraham Gregory, born August 30, 1872, and Josephine Gregory, born April 17, 1881. That he was born on March 3, 1844, St. Jude Parish, St. Hyacinthe City, Province of Quebec, Canada. That he served in the 10th Vermont Infantry Regiment, Company C, during the Civil War. That he lived in Wallingford, VT at the time of his enlistment. That his wife's name was Sophia Languirand and that at the time of this document (1915), she was deceased. That he and Sophia were married at St. Patrick's Church, Valley Falls, RI. That neither he nor Sophia had married anyone else prior to this marriage. Joseph, born in October 1869 and who died in infancy. A child stillborn in 1871. Louis A. born August 30 1872, (living, as of March 26, 1915). Josephine (Vivier?) born April 23, 1875, (living, as of March 26, 1915). Fort Slocum, MD - June to July 12, 1865. Fort Wadsworth, NY - October 1865 to August 31, 1866. A memo filed by the Finance Division of the Bureau of Pensions, dated February 18, 1929, indicates, "The name of the above described pensioner who was last paid at the rate of $65 per month to January 4, 1929, has this day been dropped from the roll because of death, January 6, 1929". See also Canadians in the Civil War from Vermont.